An Obama supporter accidentally explains her reaction to the death of Bin Laden. A liberal accidentally explains why she thinks Social Security is nothing like a Ponzi scheme. A liberal accidentally explains why she supports gay marriage. A liberal tries to explain why she wants to make gun ownership illegal. 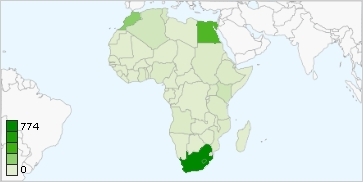 This week we will conclude our journey by taking a look at the spread of the Battlefield315 videos across Africa. A liberal explains why she thinks the entertainment industry should embed more liberal ideas into the media. This week we will take a look at the spread of the Battlefield315 videos across the islands of the Pacific. This week we will take a look at the spread of the Battlefield315 videos across mainland Asia. A socialist attempts to explain why she thinks socialism will work...this time. An Obama supporter explains why she is impressed by Obama's handling of the crisis in Libya. A liberal explains how professors should encourage students to become liberals. This week we will take a look at the spread of the Battlefield315 videos across South America, Central America, and the Caribbean.